In March 1931, after a lapse of some seasons, the Maltese Cup competition was once again introduced in the calendar with the prestigious Cousis Shield trophy at stake. The first match, between Floriana and Valletta on March 28, 1931, was a total fiasco. The attendance was scanty in the extreme and the game was devoid of any interest. Owing to injuries, illness and other reasons, Valletta were only able to field a depleted side and Floriana consequently won the tie 5-0. The second match was Amateur XI-Sliema Rangers. The Amateurs, despite missing those amateur players appearing for other clubs in the tournament, were still good enough to beat Rangers 5-1. Teams that prepared well had an advantage on those who did not as was illustrated in the last match of the first round when Sliema Wanderers met Cottonera. After a stormy first half which ended 1-1, Cottonera ran out of breath and the Wanderers were able to add four more goals. When the semi-final draw was made, Sliema Wanderers were pitted against Amateur XI while Floriana had to meet Ħamrun Spartans who received a bye in the first round. Floriana and the Spartans met before another meagre crowd on April 23. What at first promised to be a keen cup tie turned into an easy victory for the Greens who beat the Spartans 4-0. The semi-final between Sliema Wanderers and Amateur XI was played on May 10. The Blues quickly took a 2-0 lead but a heavy downpour forced the referee to abandon the match. The replay was played the following week and this time the Wanderers, after a somewhat slow start, beat the Amateurs by two goals, both scored by Teddy Holland. Once again, the final was contested by the Old Firm teams. This match, which brought to an end the 1930-31 season, was played on May 31. The final, typical of all the matches played between rivals Floriana and Sliema, developed into a grim struggle which necessitated extra-time. In the end, Floriana emerged winners 4-2. After a 2-2 draw, Victor Miller gave Floriana the lead after only a few minutes of extra-time while Grima scored a fourth goal to seal the issue for Floriana. Sliema lost the game and the Shield because they were physically too weak in comparison to the burly Floriana defenders. Football in those days was very tough and the young Sliema forwards just could not stand up to the battering of Debono, Scicluna and George Azzopardi, of Floriana. With the 1931 final the era of the Cousis Shield came to an end. 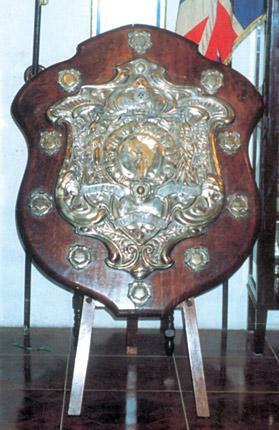 When the Shield was donated in 1915, it was stipulated that the trophy would continue to be used until all 10 plaques on it were filled by the names of the winners. The club winning the shield most times would keep the trophy outright. The Wanderers, four times winners of the Shield, should by right have kept the trophy but the owner of sponsors Cousis Cigarette Company was a fervent Flo-riana FC supporter. Breaking the rules, he donated the Cousis Shield to the Greens for safekeeping and that is where it rests to this day, in the premises of Floriana FC.